I started this series because it is good to be thoughtful. It is good to be kind and it is good to want others to do well, even if it means doing the very same thing you’re doing. God will reward a heart that is pure. That purity means loving others so much that your own ego is pushed aside. I want to help people change the world by sharing how I was able to do it...here's the kicker...not from a trust fund, not from a huge grant, rather from a $250 donation. Once you’ve read the first part of this blog series “So You Want to Start a Charity”, you’re going to be ready for the checklist. The DNA of starting a charity. Most of you don’t have millions and need to figure out how to do this on the cheap while you raise capital for the big vision. Well, I’m your girl. I was raised on modest means, so I live on modest means. I run my charity on modest means. When I hear questions about where the money goes or expenses vs. income, I have no problem answering it because I know we spend every dime WISELY AND PRUDENTLY. This blog is the framework to get started. Your checklist. After this, we’ll start breaking them down week by week. You’re passionate. That is a MUST. When Lexi was diagnosed, I can remember being so concerned as to why she was missed repeatedly. No newborn hearing screening was given even though the hospital routinely gave them. Yep, they missed the deaf baby that day. Then at her 10 week check up, the pediatrician noticed the screening had not been given. He pulled out this handheld black box and attempted to put ear pieces into her ears. I recall him saying how tiny her ear canals were. The headphones wouldn’t fit into her ears. Then, I recall being sent for further evaluation. At that appointment, we were told she was okay and the reason she didn’t “pass” was because she was fussy. We were told she had a milk intolerance, so we believed it and left. Now I know the information we were given that day “follow up in 6-9 months” is inaccurate. When a baby doesn’t pass a hearing test, it should be 2-4 weeks, especially if the issue was fussiness. So bread crumb after bread crumb until we forced our way back into Audiology at Vanderbilt when Lexi was 14 months of age. “YOU’RE CHILD IS DEAF.” Then, we hear about cochlear implants, she’s implanted four months later and she clearly has conquered deafness to live an incredible life. So my VISION. Where and how did I come to it? 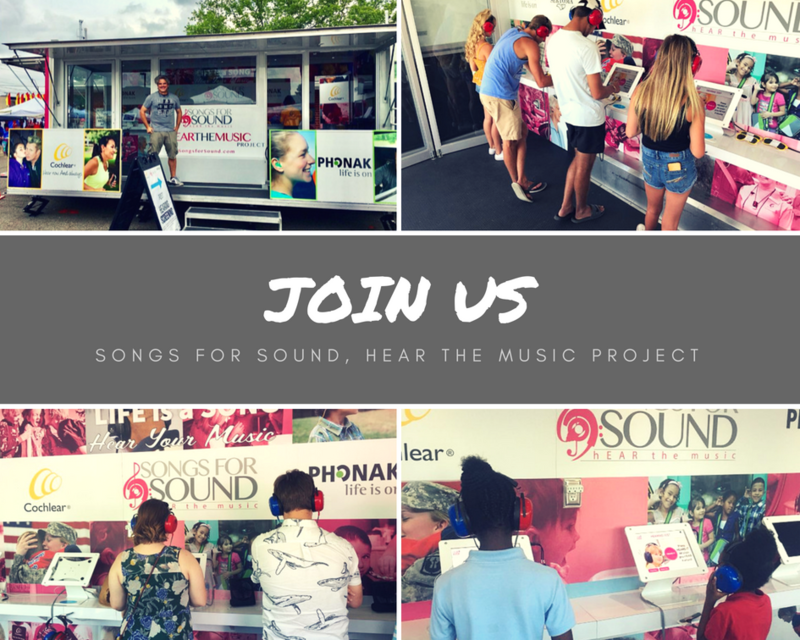 When did Songs for Sound become a thought which turned into a plan which received 501c3 status, was funded and allowed me to begin? I remember standing in my bathroom and God whispering “Songs for Sound”. I know it sounds crazy, but it’s the truth. I find it also interesting that it was an AUDIBLE WHISPER with SPOKEN LANGUAGE. The very thing that He restored in my daughter – the ability to HEAR & SPEAK. He didn’t give me that voice, idea, thought until after HE BROKE MY HEART. When God asked me to “go and do and trust”, I had to go through some very difficult things. My daughter’s deafness was not only MISSED, but more importantly, my daughter is DEAF. I had been plagued with the thought of small children in rural communities, or the inner city, being left behind, missed, not diagnosed. “If this can happen in Green Hills in Nashville, one of the wealthiest areas of town, what is happening in towns like where I grew up? Small towns. Inner-city neighborhoods too.” I thought. You see, not only was Lexi’s pediatrician in Green Hills, but the office is SEVEN MINUTES from Vanderbilt, one of the best programs in the world for hearing and speech disabilities. I’m not blaming her doctor. Sure, I was upset with him for missing this. However, God permitted it so her story could do everything it’s doing then and TODAY! WHAT DO YOU DO WITH PAIN? USE IT. Every day, all day, I continued to ask all sorts of questions. I studied hearing loss. I read so much research. I worked in Development at Vanderbilt (shocker God used that too!) and I recall having meetings with the brightest minds just doing my homework. POINT: YOUR VISION MUST HAVE PURPOSE. Right now, as you have a vision. You need to really dive into your mission. What is your purpose and IS THERE A NEED? 1. Take NOTES. Lots and lots of notes. 2. Meet with experts. Lots and lots of experts. 3. Ask if there are needs in this area and what possible remedies could help this social problem? HOMEWORK: Your mission statement. A 3-5 sentence paragraph about what breaks your heart and how you will change the world.